Metabolic and mitochondrial abnormalities are a prominent feature of aging and neurodegeneration. However, the literature reports conflicting results concerning the extent and causality of the aging associated aerobic energy production decline and mitochondrial ROS-induced damage, as well as their interplay with nutritional cues. Single cell models have provided key information concerning mechanisms of aging and neurodegeneration. 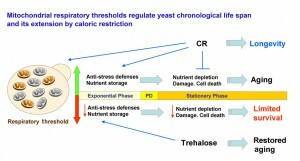 In collaboration with Dr. G. Shadel (Yale University, USA)), we have gained insight into the mechanism by which tor1 mutations extend yeast lifespan and have characterized the role of mitochondrial respiration in regulating yeast lifespan and its extension by caloric restriction (reported in two Cell Metabolism papers). 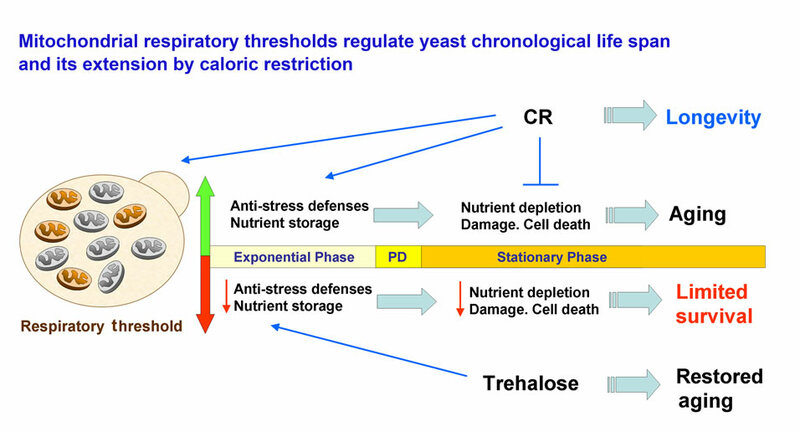 We are now testing the hypothesis that mitochondrial respiration and ROS signaling interplay with nutritional cues and perform complementary roles on regulating the manifestation of age-induced cellular proteotoxicities. We have developed novel transgenic yeast expressing human neurodegenerative disease-relevant proteins that recapitulate key features of neuronal proteotoxicity and have facilitated the elucidation of basic cellular mechanisms of toxicity triggered by human neurotoxic proteins. For example, we have shown that proteotoxicity can be suppressed by enhancement of mitochondrial biogenesis or by overexpressing the enzymes in the NAD+ salvage biosynthetic pathway. In collaboration with Dr. Grace Zhai (Molecular & Cellular Pharmacology, University of Miami), we have observed that similar effects are observed in Drosophila models of polyglutamine disorders. Results from ongoing experiments indicate that under stress, these proteins act as molecular chaperones to combat proteotoxicity.